Baby Bug is full of firsts lately. He's growing so fast, getting bigger! We finally (at 20months old) found shoes to fit his big ole feet. He has THICK, FAT ,WIDE feet..lol poor kid, hopefully they'll thin out someday but for now he has to wear an Extra Wide. Now that he finally has shoes that fit, he gets to :gasp: walk sometimes when we go out and about. It's so completely freakin adorable to have this little cherub walking beside you sweetly holding your hand (until he's not and throwing a tantrum because you are clearly going the wrong way!). Apparently my days of wearing him are now gone :( The days of us being like one, where he was literally attached and always safe.. gone. I'll miss it- although I doubt my back will. But my last baby is growing up. It's hard to let go. Baby Bug aka The Toddler is also quite the climber. He will scale the dining room chairs & be sitting on the table getting into everything before you can get out of your chair. He climbs onto the end tables to stand up and flick the light switch on and off... on and off.. It's to the point that I have to put him in his highchair or take him with me to go pee for pete sakes! The boy is into EVERYTHING.. If you catch him, of course he closes his eyes and smiles.. He can't see you, obviously you can't see him. The giggle gets him out of trouble everytime- maybe I'm getting soft?! So it doesn't really surprise me that his whirlwind attitude ended in pain last nite. While climbing/running/being ornery- he managed to fall down and hit his face on the ROUNDED coffee table. The fact that my couch now has a nice blood stain proves that he's a little too much like his brother. He cried for 2.4seconds, ran to daddy w/his paci and laid his head down to hum for a minute. 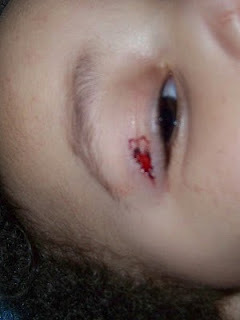 It wasn't til Daddy looked more closely and saw blood coming from his eyelid that we all started to freak out. uhmm le ouch! It looks even better today- not! I completely freaked out.. I'm like OMG it's his EYE, the baby's EYELID is bleeding! What do we do? In the end, by the time I called Casa and was attempting to call the caseworker- he was already up running around giggling. We all decided that we'd just wait & watch. Crazy kid. Heart failure, I tell you.. **side note- Drama Queen (who is truely living up to her name this week) insists it looks like a heart.. The boy has heart like talent, what can I say? I miss the baby wearing days looking at that photo! Precious! Glad the eye is okay, he is obviously an active boy. I have one of those too and we had an ER visit 6 months ago with a big gash in his forehead, lovely! LOL, he closes his eyes so he won't get in trouble. You can't see him to yell at him! LMAO, he's gonna' be a smart one, look out! awwww... I love fat baby feet! But that poor eye, I don't like that :( At least he's a trroper.